In World-Systems Analysis, Immanuel Wallerstein provides a concise and accessible introduction to the comprehensive approach that he pioneered 30 years ago to understanding the history and development of the modern world. Since Wallerstein first developed world-systems analysis, it has become a widely utilized methodology within the historical social sciences and a common point of reference in discussions of globalization. Now, for the first time in one volume, Wallerstein offers a succinct summary of world-systems analysis and a clear outline of the modern world-system, describing the structures of knowledge upon which it is based, its mechanisms, and its future. 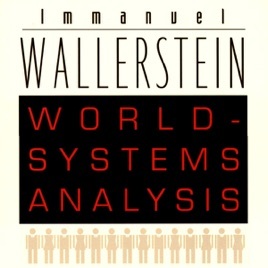 Wallerstein explains the defining characteristics of world-systems analysis: its emphasis on world-systems rather than nation-states, on the need to consider historical processes as they unfold over long periods of time, and on combining within a single analytical framework bodies of knowledge usually viewed as distinct from one another-such as history, political science, economics, and sociology. He describes the world-system as a social reality comprised of interconnected nations, firms, households, classes, and identity groups of all kinds. He identifies and highlights the significance of the key moments in the evolution of the modern world-system: the development of a capitalist world-economy in the sixteenth-century, the beginning of two centuries of liberal centrism in the French Revolution of 1789, and the undermining of that centrism in the global revolts of 1968. Intended for general readers, students, and experienced practitioners alike, this book presents a complete overview of world-systems analysis by its original architect. The book is published by Duke University Press.